A flakie topper by Catrice! My heart skipped a beat when I saw it! I love flakies, if you haven’t noticed. So of course Glitterazzi needed to go home with me. The colors of the flakies are gorgeous. There are mostly green, teal and blue with some gold flakies in a clear base. These seem more like big shreds than subtle flakies though. Despite the two mixing balls it is impossible to shake/roll this before use. The mixing balls barely move. The formula is extremely thick! Way too thick if you ask me. That makes an even application very hard. The flakies/shreds are stubborn and not very flexible (similar to the Models Own flakies) which causes them to not lie flat on the nails. I found that it works best by loading up the brush and ‘scoop’ the flakies/shreds out of the bottle on to the brush (so no wiping the polish off on the neck of the bottle), then apply it on the nails by using a dabbing motion. That’s what I did to achieve the look as shown above. I did add one generous coat of Seche Vite to get rid off the ‘poking’ flakies/shreds. Nevertheless the result is still thick and bumpy. Such a shame, because the flakies are so pretty! 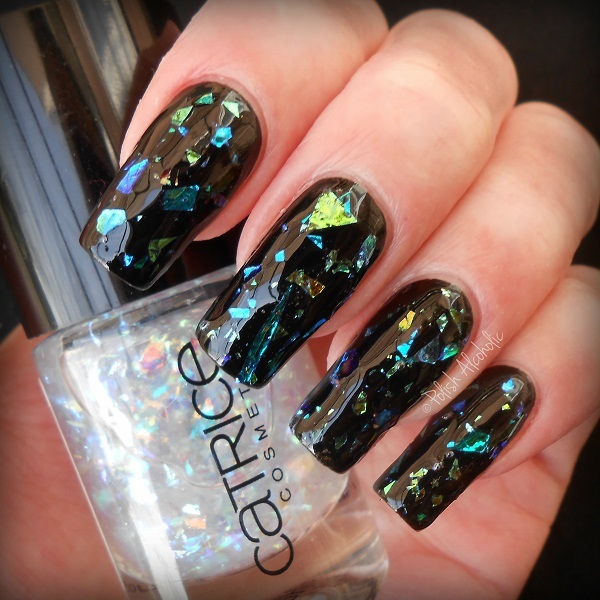 This entry was posted in Catrice and tagged catrice glitterazzi, nagellak, review, swatches by Polish Alcoholic. Bookmark the permalink. Yeah, I agree. Such a big bummer because I really love the color of the flakies! WOW, such a cool flakie!! Beautiful! I had a similar one from W7 which wasn’t as packed with the stuff as I had hoped, so dabbing was required twice! This looks better. I think I must have it. 😀 It is lovely. I just wanted it to have a better formula. Ik snap wat je bedoelt. En dat vind ik zo jammer, want hij is zo mooi!